A number of extrasolar planets have been found in the past two decades and now researchers agree that planets can have a wide variety of characteristics. However, it is still unclear how this diversity emerges. Especially, there is still debate about how the icy giant planets, such as Uranus and Neptune, form. 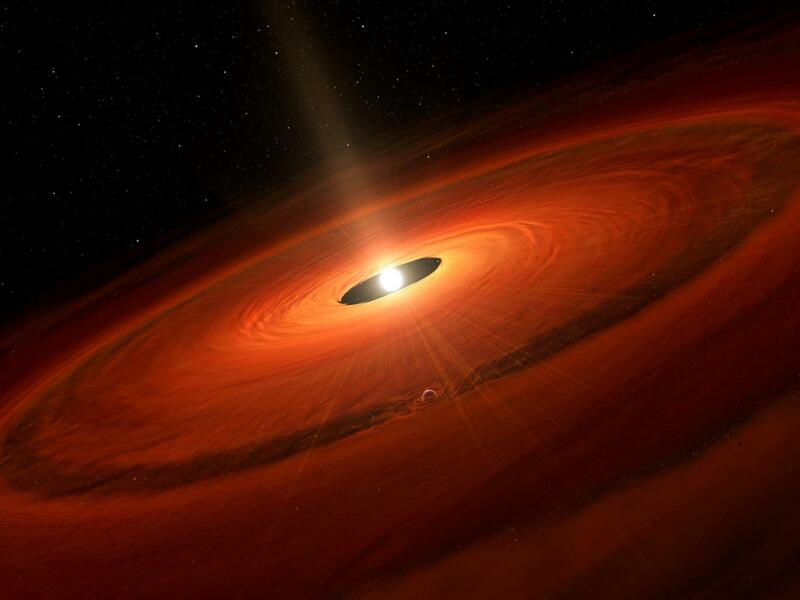 To take a close look at the planet formation site, a research team led by Takashi Tsukagoshi at Ibaraki University, Japan, observed the young star TW Hydrae. This star, estimated to be 10 million years old, is one of the closest young stars to the Earth. Thanks to the proximity and the fact that its axis of rotation points roughly in the Earth's direction, giving us a face-on-view of the developing planetary system, TW Hydrae is one of the most favorable targets for investigating planet formation. Past observations have shown that TW Hydrae is surrounded by a disk made of tiny dust particles. This disk is the site of planet formation. Recent ALMA observations revealed multiple gaps in the disk . Some theoretical studies suggest that the gaps are evidence of planet formation. The team observed the disk around TW Hydrae with ALMA in two radio frequencies. Since the ratio of the radio intensities in different frequencies depends on the size of the dust grains, researchers can estimate the size of dust grains. The ratio indicates that smaller, micrometer-sized, dust particles dominate and larger dust particles are absent in the most prominent gap with a radius of 22 astronomical units . Why are smaller dust particles selectively located in the gap in the disk? Theoretical studies have predicted that a gap in the disk is created by a massive planet, and that gravitational interaction and friction between gas and dust particles push the larger dust out from the gap, while the smaller particles remain in the gap. The current observation results match these theoretical predictions. Researchers calculated the mass of the unseen planet based on the width and depth of the 22 au gap and found that the planet is probably a little more massive than the Neptune. "Combined with the orbit size and the brightness of TW Hydrae, the planet would be an icy giant planet like Neptune," said Tsukagoshi. Following this result, the team is planning further observations to better understand planet formation. One of their plans is to observe the polarization of the radio waves. Recent theoretical studies have shown that the size of dust grains can be estimated more precisely with polarization observations. The other plan is to measure the amount of gas in the disk. Since gas is the major component of the disk, the researchers hope to attain a better estimation of the mass of the forming planet. See the press release "Planet Formation in Earth-like Orbit around a Young Star" issued on March 31, 2016 for more details. Astronomers observed radio waves from TW Hydrae in only one frequency in the previous observations and could not estimate the size of the dust particles. One astronomical unit corresponds to the distance between the Sun and the Earth, 150 million kilometers.